Nvidia has announced a special edition graphics card just in time for the holidays. The GTX 560 Ti with 448 CUDA cores is positioned squarely between the existing GTX 560 Ti with 384 cores and the GTX 570 that features 480 cores. Specifications on the 560 Ti 448 include a 1.46GHz clock on the CUDA cores, 732MHz for the graphics clock and 1.2GB of memory clocked at 3.8GHz. The card supports three-way SLI, DisplayPort, HDMI and DVI. Specs aside, we couldn't help but think it was a bit odd for Nvidia to release a holiday graphics card. There’s actually some logic behind the move. 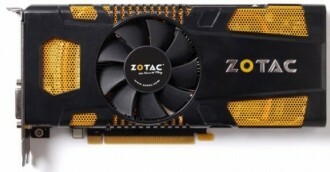 This new card is built around the GF110 GPU that powers higher-end graphics cards like the GTX 580 and 570. The 580 features a fully functional GPU while the 570 is handicapped a bit. This new 560 Ti represents a further scaled back version of the same GPU. Simply put, chips that couldn’t pass requisite testing for GTX 570 use but were still workable are being used for 560 Ti 448 cards. Once the supply of binned GPUs runs out for these cards, they will be gone forever, hence the limited edition moniker. The card is available immediately for $289 in the US, Canada, France, Germany, UK, Russia and Nordic countries through the likes of MSI, ASUS, Gigabyte, EVGA and Zotac. Early reviews on various branded cards look promising and as such, these are likely to sell out pretty quick. If you want one or more for SLI, we recommend making the purchase sooner rather than later.